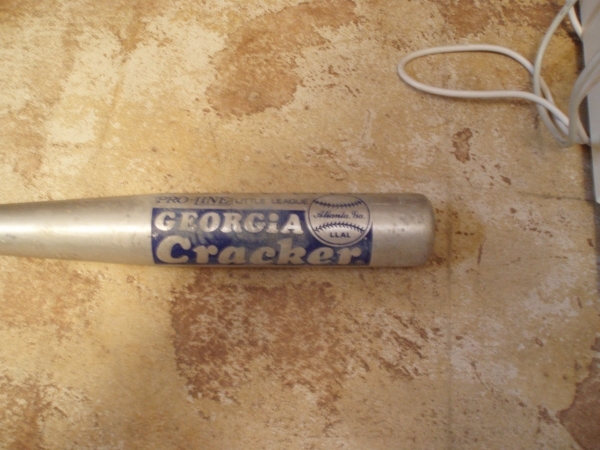 While attending a few garage sales in my hometown in Kansas, I seemed to have come across a relic that is many miles from its home: Jeff Francoeur’s little league bat, a PRO-LINE Little League SUPER-LITE Georgia Cracker, made in Atlanta, GA, Size 9. It is the fabled bat that Jeff used to swing at pitches in the Atlanta area. It didn’t matter if he missed the ball or hit a warning track pop up, he always loved his Georgia Cracker. It was rumored lost when his parents had a garage sale after he joined the Braves in 2002. It was spotted a few times, but no one knew for sure of its location or owner. I feel fortunate to have found the bat and hope to make a pilgrimage up I-35 to return the bat to its iconic owner soon. I will enjoy having it in my possession for a little while and maybe, just maybe, go take a few swings with it. We hoped you liked reading Found: Jeff Francoeur’s Little League Bat by Jeff Zimmerman! That’s not Frenchy’s bat, it has scuffs on the sweet spot.